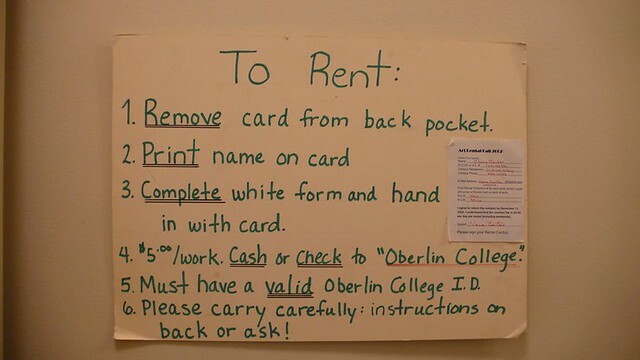 Founded in 1940 by Ellen Johnson, the Art Rental Program allows Oberlin students and members of the community to rent up to two original works of art each semester for just $5 each. Students line up in the museum courtyard—and in some cases, camp overnight—to take works by artists such as Toulouse-Lautrec, Picasso, and Red Grooms and mount them in their residence hall rooms and homes. The collection includes more than 400 prints, paintings, photographs, and sculptures. Oberlin began its commemoration of Black History Month more than 30 years ago following the establishment of a Black Studies Department in 1967. Early efforts by the department involved a day or weeklong program with a keynote speaker, or a series of events sprinkled throughout the month that brought in prominent civic and political leaders, scholars, writers, dancers, and musicians of African descent. In recent years, a committee led by faculty and staff from the Africana studies department and the Multicultural Resource Center has organized these events. Programming often centers on the theme established by the national Black History Month organization, the Association for the Study of African American Life and History. The committee often receives financial and in-kind support from several academic and administrative departments and some community organizations. The committee’s leadership, with support from other partners, has brought to campus a rich and diverse collection of events that touch upon the cultural, social, political, spiritual, artistic, and historical issues that define Oberlin. The Big Parade project began in 2002 as a collaborative arts event created by artist Zach Moser ’02. He described the project as an experiment in the power of our human need to express ourselves as well as in the effectiveness of decentralized organizing theory. The premise was to facilitate a parade that allowed an open forum for individuals and organizations to represent themselves in any way that they saw fit. Since that time, the Big Parade has become a cherished ritual in Oberlin, bringing residents of all ages together in a homespun, imaginative, community arts event that depends on widespread collaboration and team work. Groups involved in the Big Parade work relatively independently, but toward a common goal: to represent themselves and the town of Oberlin in a joyous and spectacular event featuring music, dancing, costumes, bikes, art cars, floats, and whatever other ideas emerge. A festival with various performances and live music follows the parade in Tappan Square. The event often includes a free barbecue lunch, games, crafts, face painting, a moon-bounce, a pie-eating contest, a free raffle, and much more. The Big Parade typically takes place on the first Saturday in May. Commencement has been a mixture of tradition and ceremony often taking place on Tappan Square and in earlier years, inside First Church or Finney Memorial Chapel. From the big tent brought in by late 18th century revivalist Charles G. Finney to lighting the campus walkways with Japanese lanterns, Commencement at Oberlin has always been a distinctive occasion. While ceremonies have changed over time, the basic concepts of pageantry, hopefulness, purpose, and celebration have remained. The Oberlin Collegiate Institute (renamed Oberlin College in 1850) granted its first degrees in 1836 in the Theological Department. On September 6, 1837, the college presented its first four AB degrees. When the college changed its academic calendar in 1878 to reflect the dates of other colleges and universities, Commencement began taking place in June. Before 1895, the Oberlin Conservatory of Music did not issue degrees; however, it later joined the college’s AB degree ceremonies to present diplomas and certificates to its graduates. By 1905, the conservatory began issuing the new Mus.B. degree, following the lead of Boston University in granting a bachelor’s degree in music. Academic regalia, graduation robes, and mortarboards have not always been a part of the Oberlin tradition. Early graduates maintained a class uniform or hat. Mortarboards first began appearing in Oberlin in 1881. The tradition of wearing a cap and gown finally took hold in 1907, even though students in recent years have opposed wearing academic attire. With the formation of the Alumni Association in 1939, more alumni began returning to campus for the occasion, which led college leaders to create a more elaborate and extensive celebration. Today’s Commencement is full of pomp and circumstance. Now called Commencement and Reunion Weekend, it is perhaps the largest annual campus event open to all members of the Oberlin community. Oberlin College and community enjoy a long, proud history of discussing important and compelling issues. To deepen that dialogue, over a decade ago the Office of the President, in partnership with the Finney Chapel Lecture Committee, inaugurated what is now the annual Oberlin Convocation Series. The series has brought to campus many of the country’s leading thinkers who represent an array of viewpoints, disciplines, and professional fields. These lectures are free and take place in Finney Chapel. This tradition took on a formal role in the early 1940s. President Ernest Hatch Wilkins started the Calendar of Assemblies program during his administration. These series of assemblies took place twice during the academic year with a Christmas Assembly in December that featured a concert by Conservatory of Music faculty and student groups. The president gave the first address each September. In addition, the college required students to attend eight of the 12 to 15 assemblies in each semester of residence to fulfill graduation requirements. All assemblies took place at noon in Finney Chapel. Among the speakers during that time: Ralph Bunche, Paul Sears, Clarence Ward, Aaron Copeland, e.e. cummings, Barbara Ward, and James Reston. Campuswide assemblies continued under President Robert K. Carr during the 1960s, yet under a new name: The All-College Assembly. Its purpose: “promoting understanding of and participation in the ideas and activities of the college and to bring into focus for the entire student body events and issues that are relevant to the lives of all.” Margaret Mead, Tom Wicker, Martin Luther King Jr., Roy Wilkins, Archibald Cox, Henry Kissinger, Kenneth Clark, and Ralph Nader, were among the many emerging political and academic leaders, social scientists, and activists brought to campus. In the 1980s and 1990s, students helped organize and plan these assemblies through their election to the Student Assemblies Committee and work with the faculty-based Assemblies Committee. In 1992, the college faculty formed the Finney Lecture Committee which took charge of what had become a Distinguished Lecture Series, and developed a new program: Campus Convocations. In the 1999-2000 academic year, the program became the Oberlin Convocation Series , which continues the mission of presenting thought-provoking public discourse by some of the nation’s leading intellectuals. Oberlin’ s Learning and Labor motto has inspired generations of students to engage in hard work both in and out of the classroom. A more coordinated effort began in 1996 by the college’s Bonner Center for Service and Learning. Through the Day of Service, incoming Oberlin students have an opportunity to perform community service at various area sites right from the start of their academic careers. Students volunteer at partner agencies within 30 miles of Oberlin. The day gives students the opportunity to leave campus and provide valuable service to community organizations—from tutoring middle-school students to restocking a neighborhood food bank. Students with disabilities are encouraged to participate; the Bonner Center provides all necessary accommodations. The Day of Service is often the springboard for continued community involvement and volunteerism. Activists within Oberlin’s Lesbian, Gay, Bisexual, Transgender, and Questioning (LGBTQ) communities began Drag Ball to celebrate non-normative gender presentation and the art of drag. Initially, the celebration was the final event of Oberlin’s first Transgender Awareness Week in the late 1980s, but has since become its own entity. Drag Ball transforms the Student Union into a massive gender-bending nightclub, complete with three dance floors, a main stage runway competition, and professional performers and DJs celebrating the many possibilities of their gender presentation. The college-sponsored, student-organized event requires year-round preparation. Attendees and participants actively and playfully resist gender norms, which speaks directly to the legacy of activism at Oberlin. The first illumination in Oberlin occurred in November 1860 to celebrate the election of Abraham Lincoln as the 16th president of the United States. However, the longstanding tradition began in May 1903 during the inauguration of Oberlin College President Henry Churchill King. Frederick O. Grover, professor of botany, helped mark the occasion by stringing and lighting Japanese lanterns around campus. The former Harvard professor suggested it after a custom he had witnessed of illuminating the Harvard Yard. The college purchased several thousand lanterns to string along the posts on campus and several streets of the town. Except for three interruptions, the custom of illuminating the campus continued annually until 1932 when it was canceled for financial reasons. The outcry was such that the college re-instituted it in 1933 and purchased an additional 20,000 lanterns. Illumination night eventually became a tradition held during Commencement/Reunion Weekend. Tappan Square, the central park in the middle of town, is home to three large rocks formed by glaciers long ago. They are monuments from the classes of 1882, 1898, and in honor of the founders of the college, John Jay Shipherd and Philo Penfield Stewart. For more than 40 years, these boulders have been subjected to regular graffiti, transforming them into colorful billboards announcing events, congratulations, birthday wishes, and more. You may hear some buzzwords spoken around campus that are unfamiliar to you. No worries. Review our Oberlin Slang.